As a new, old shooter, I read this forum regularly, and thanks to all those who's posts have helped me. I have a MK III with a Bushnell TRS25 red dot and a Volquartson trigger. After well over a thousand rounds the pistol has been broken down only twice for cleaning, but after every outing I use a bore snake, brush removed, Q tips, and a tooth brush. I use Hoppes, Froglube and Rem oil. I have used Aquila Supper Extra plated, CCI Mini Mags both HP and RN, CCI Blazers, and CCI Standard Velocity LRN, and SK. All have worked very well, having only 3 malfunctions since new. I have had one stove pipe and one fail to feed both time while using Aquila Supper, and one fail to eject using a brand I don't remember. I went through the NRA Winchester Marksmanship course, I sighted the red dot in for 15 feet, using a Pistolreo Rest from Wally World. I simply tried to make certain the point of aim was at the same exact place each time, and fired 3 round groups. The groups were consistently .5" After making Distinguished Expert, heck, at 15 feet you could almost throw the rounds and hit the black, I decided to try an indoor Bullseye League. 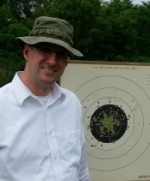 I sighted the pistol for 50 feet, and it was holding 1" groups. Off I went to Tampa Shooting Sports, certain I had a lock on the last place. There I found the group friendly and helpful, explaining how things worked, etc. Those folks can really shoot! Once I get my wobble, breathing, stance, grip, aim, and trigger squeeze better, I can go from shooting a 709 with 2X's (out of 900) to a 710 and 3X's. Then I'll have a lock on second to last place. If I ever get even close to being able to hold the 1" groups the MK III is capable of, watch out! Even though its 1 1/2 hour drive, I'll be back. Bullseye is fun! Its all about bettering yourself, each match try and pick up a few points soon you will be headed for the top of the score board.